The conventional narrative on 2016 US presidential candidate Donald Trump is that he has succeeded despite his rejection of political correctness. Here, Robert Folsom explains that Trump has in large part succeeded because of it. Trump gives voice to the political discontent that flows from negative social mood. Long-term trends in social mood consolidate collective tendencies.1 Political correctness epitomizes collective tendencies toward inclusion, pluralism, contrition and tolerant speech. It was formalized and entrenched by the same long-term positive mood trend that drove the great bull market of the 1980s and 1990s. In politics, this process has been manifest in the actions of all branches of government. 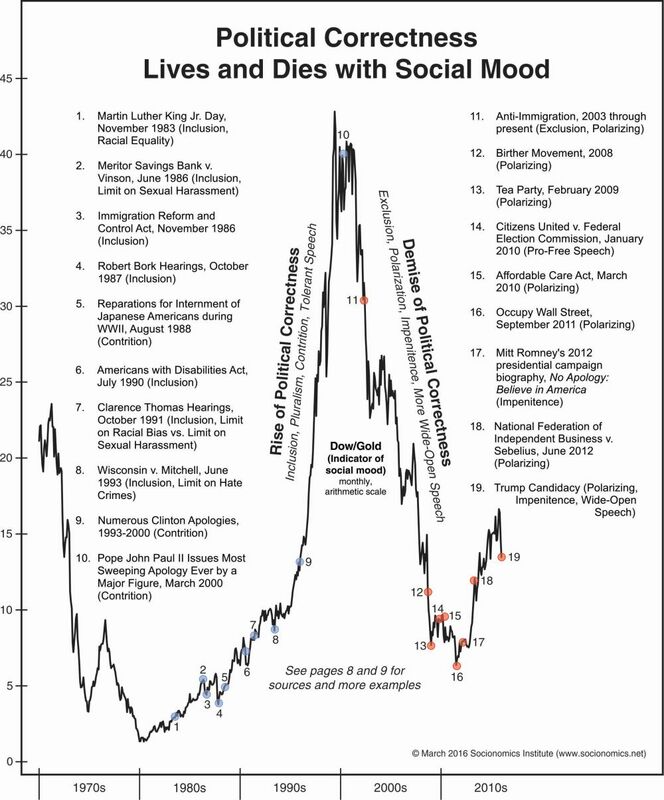 Positive-mood expressions characterized politics from the early 1980s thru the peak year of 2000; negative-mood expressions followed, became pronounced in 2008 and have been especially conspicuous since spring 2015. Today’s negative mood involves unformalizing the norms of the previous positive trend. Political correctness and the collective tendencies it epitomizes have given way to a new normal of exclusion, polarization, impenitence and more wide-open speech. The differences before the year 2000 vs. after are stark when put in visual contrast. Figure 1 plots key events in the life and death of political correctness against the Dow/gold ratio. Gold is real money, so Dow/gold is how the Dow Jones Industrial Average would look if the U.S. had remained on the gold standard. It is a fascinating reflection of social mood. From its 1980 low, Dow/gold rose more than 3,000% into its 1999 high, fell 85% to its 2011 low and today remains down 66%. It has done a great job capturing the mood behind the rise and fall of political correctness, along with society’s increasing desire in recent years to bury the political status quo. By 1999, political correctness had reached full bloom. It became a social norm and included literal codes of speech and conduct on college campuses and in workplaces. The trend encompassed ideas like diversity in hiring and new laws against sexual harassment and hate crimes.2 It also embodied a spirit of apology, mending fences and coming together. As mood trended toward a peak at multiple degrees of trend, the formalization of political correctness expanded beyond the American tradition of e pluribus unum (from many, one) to more extreme expressions like multiculturalism and postmodernism. Political correctness became the shorthand reference for all of the above, particularly by embracing limits on speech. There has always been a built-in friction between the American ideal of free speech and the American ideal of inclusion. The question is which ideal—free speech or inclusion—has a more dominant role in the broader culture and society. The answer depends on when, because at any given time, social mood exerts the critical influence. A turn toward positive mood shifts the emphasis to inclusion; whatever its flaws, political correctness is about making people “feel included” (and censure speech critical of gender, ethnicity, religion, etc.). Conversely, negative mood shifts the emphasis back toward anything-goes free speech. That Justice Kennedy found metaphysical liberty in the U.S. Constitution makes this quote a fitting reflection of other similar government actions and episodes during the same period. Political correctness also epitomized a moderate, compromising tone in politics. Yes, political battles occasionally grew hostile, but particularly grizzly forms of political combat were generally reserved for the “Stupid Season,” the period immediately before an election, starting around the first of September. That was when candidates (and supporters) would say almost anything for victory, and almost anything against opponents.6 “Stupid Season” always ended on Election Day—after compliments for a hard-fought campaign, candidates shook hands and a diplomatic tone regained dominance in the political discourse. That was the tradition in American politics. Observers of the 2016 presidential primaries may lament that civility has vanished from American politics. But the guttersniping and belligerence in the race only comprise the latest chapter in the long-term trend that has ridden the wave of negative social mood. Some people may think, well, “That’s the New Yorker in Trump.” But Rudy Giuliani, Ed Koch, Mario Cuomo and Michael Bloomberg are all New Yorkers: They did not make a habit of being politically incorrect and vulgar in public. These other New York politicians may have talked fast and had short tempers, but they did not go to rallies and call their rivals obscene names. The potentially more lasting side of Trump’s political incorrectness involves policy. In fact, the issue which has most defined Trump’s candidacy is also America’s oldest ongoing political controversy: immigration. As noted in Figure 1, 1986 was the last major legislative change to immigration policy. But in 2016, immigration could erupt into the most contentious debate of the presidential election. The politics of that debate have already overlapped with religion. Pope Francis was recently asked “what he thought of Trump’s campaign pledge to build a wall along the entire length of the border and expel millions of people” who are in the U.S. illegally. It is no stretch to suggest that if mood were more positive, any one of these remarks may have proven fatal—that is, too politically incorrect for a candidate to remain viable. Today, they resonate with a large swath of the electorate. Scalia’s remark was arguably a much greater violation of political correctness than were Lawrence Summers’ remarks more than a decade ago. And Scalia spoke before a public audience, yet his comment went almost unnoticed. What was the difference? The timing. The condemnation of Summers was just five years after the 2000 peak, while the impunity Scalia enjoyed came 15 years after, and well into the negative mood trend. It is easy to think that Trump single-handedly demolished the rule about being politically correct. Yet his success is an effect—not the cause. Trump gives voice to the political discontent that flows from negative social mood. Gallup regularly asks survey participants, “What do you think is the most important problem facing the country today?” Throughout 2015 and into 2016, the most common answer has been “Dissatisfaction with government/politicians.”35 In fact, Gallup has found that Americans have generally been growing more dissatisfied with the way things are going in the United States for more than 15 years.36 The public’s collective dissatisfaction and negative mood are bigger than one man’s campaign. The January issue described the non-traditional, outsider and frequently anti-establishment candidates from this presidential election season who have benefited from the public’s dissatisfaction with the political status quo.37 The most successful of those outsiders is also the candidate who has waged the most vitriolic war on political correctness: Trump not only rides the wave of negative social mood, he channels it into his persona, tone, message and policy proposals. And Republican voters have rewarded him with presumptive nominee status. Yet the traits and tactics that connect with many voters also repulsed the party’s elite. The 2016 presidential race was the most fractious since 1968.38 In the days immediately following Super Tuesday (March 1), the campaign mutated from a semi-amusing food fight among the candidates into an epochal mood-driven political showdown between Trump and the Republican establishment. Never before in modern political history has the immediate past nominee of a party delivered an entire speech condemning the current front-runner. Many Republican leaders have given grudging support to Trump, yet a broader “setback, radical change or dissolution” remains possible after the July 18-21 convention in Cleveland. A third-party candidate who carries even a couple of states could mean no candidate receives the required majority in the Electoral College (270 of 538 electoral votes)—which in turn may lead to a constitutional crisis. According to the 12th Amendment, Congress and the states would have to sort out the mess. But how that might go is unknown, because the United States has not faced a crisis of that kind since the disputed election of Rutherford B. Hayes in 1876. Upheaval on this scale in the 2016 election could even lead to a change in the Constitution regarding the Electoral College. Yes, that may seem like an “extreme” scenario—but no more so than Prechter’s “radical change or dissolution” of a party forecast, which in fact appears less extreme by the day. 1Prechter, Robert R. Jr. (2002). Human Social Behavior (pp. 230-231). New Classics Library. 15Prechter, Robert (October 2003). The Elliott Wave Theorist, p. 8. 27Prechter, R. (1989, February). A Turn in the Tidal Wave, Part II: Implications (p. 82). Gainesville, GA: New Classics Library.